Least expensive one the market in years! This special offering is likely the most expensive yacht ever built by Helsen and Hunter at a cost of over $700,000 to build, and her name is Belle Ile! One of two ever built and both on the resale market. Belle Ile is $60,000 less expensive!! The Signature 470 has 167 upgrades from the Hunter 460 model. Here is the history of the Hunter-Helsen Signature 470. Johannes “Jopie” Helsen turned the stock 46-foot Hunter Sailboat into an elegant high end cruising yacht at Sailor's Wharf, his boatyard on Salt Creek in St. Petersburg. One of the most dramatic changes is in the hull itself. Helen cut off the transom of the production boat and designed a new sugar scoop that adds 1.5-feet to the overall waterline, giving the boat better performance and an updated look. The extended transom also provides a platform for diving and swimming. The trailing edge of the keel is faired for good upwind performance. Other upgrades include a stainless steel and vinyl rub rail, an Awlgrip paint system in custom colors, a 22-karat gold leaf sheer stripe, Harken hardware, electric halyard winch and a steel cockpit arch. Helsen worked with Mark Pooch of Doyle Sails in Clearwater to produce a performance sail package and added 100 square feet to the sail plan. The upgraded interior is elegant ash and teak with a teak and holly sole. The interior features an entertainment system that includes multiple flat-screen televisions. Stainless steel hatches and ports have custom shades that convert to screens. The master stateroom berth has a thick custom mattress made in California specifically for the Signature 470. Corian custom counters and faucets with gold accents were added. The Signature 470 has 167 upgrades from the standard Hunter 46. “Belle Ile” is Helsen's masterpiece with a rich dark forest green Awlgrip hull. The three stateroom, two head layout provides perfect accommodations for two couples with some grandkids included. She is designed to be comfortable and pleasing in every aspect with the interior design completed by a professional (expensive) interior designer choosing the window treatments, upholstery, carpets, artwork, brass lighting, Corian, and soft high quality coverings all professionally implemented. The intention of total comfort continues right into the cockpit that is perfect for entertaining with seating for about ten people with a walk-through transom, swim platform, and a large cockpit table and many drink holders. The new (2016) bimini, dodger and enclosure provide shade and weather protection and of course there are cockpit cushions. 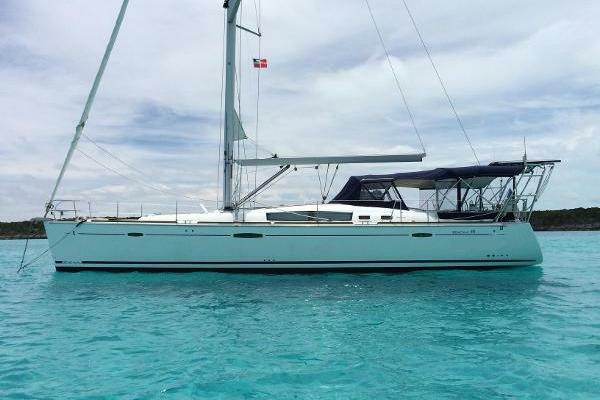 There is no shortage of amenities to rival any other sail boat with the ice maker, flat screens TVs, air conditioning and a large 6kw Northern Lights Genset with less than 750 hours on it to run everything while underway or on the hook. The efficient 75 hp Yanmar will leave you impressed as you glide through the waters of your choice. 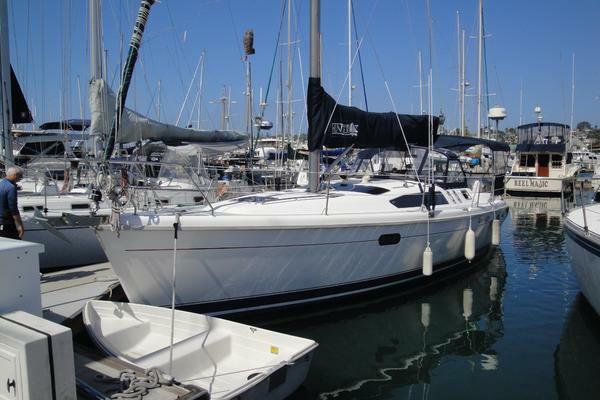 This vessel is complete with everything you need to start enjoying sailing and cruising today. The electronics, navigation and communications systems are all current with Raymarine color radar/plotter with displays at the helm and at the navigation station. There is nothing else you need to buy, nothing to upgrade, just write one check and start cruising right here. Cruise down to Florida, Bahamas, or New England and see how life looks from the water side. You won't miss home, that is safe to say. Enter the cockpit by way of either the port or starboard boarding gates of through the walk-through transom. The cockpit is large and features a well-appointed helm with all engine gauges and electronics within easy each. The pedestal has three-fold out high varnished wood tables that allow an alfresco dining or relaxation area. The seating is massive and will seat a crowd on comfortable closed foam cushions. While underway there are port and starboard stern seats to. The side deck is easily maneuvered with a 360-degree ability to move freely from bow to stern. The cockpit is fully enclosed with a tan Sunbrella bimini, connector and dodger with eisenglass. The stern features a custom built stainless steel radar arch that also support overhead solar panels, wind generator and the dingy davit system. There is an outboard motor hoist on the starboard side. Entering the main cabin is forward with a huge sliding overhead hatch and folding doors. The entry is unlike most sailboats as it features nice slopped teak treads with stainless steel handrails. The entry is like home steps. Once inside the main cabin the enormity of the Helsen 470 is apparent. Under the companionway steps is access to the engine compartment as well as removable storage tray that allows access onto the engine top. To starboard is the day head shared with the starboard stateroom. The head features a Vacu-Flush toilet and a shower stall. Further aft is the head vanity which steps through into the aft starboard side stateroom. There are privacy doors between the head and vanity as well as the stateroom. The starboard aft stateroom is large and has a queen berth situated with the headboard aft. Along the port side are numerous storage cabinets with a small shelf above. Above the cabinets is an opening port. All the way forward on the port side is a cabinet with access to the generator. A hanging locker is along the starboard aft bulkhead with an opening port and beautiful wood slates. A privacy door separates the stateroom from the salon. The port side aft stateroom is situated aft of the galley. The stateroom is unique in that the berth is a single berth situated inboard, with the headboard aft while outboard is a hinged watch berth for underway accommodations. Along the port side is beautiful wood slates and an opening port. Forward is a hanging locker with a shelf above. Along the starboard side and forward is additional access to the generator. A flat screen TV with built-in DVD player is mounted on the port side. A privacy door separates the stateroom from the main cabin. The L-shaped galley is massive and will please even the most discriminating onboard chef. Just beyond the companionway and to port. The galley features beautiful green Corian countertops with fiddles, and plenty of storage and food preparation area. Inboard is a large cabinet with double stainless steel sinks and a faucet with sprayer as well as a cold-water faucet. There is a drop-in trash receptacle aft. Aft is the gimbaled stainless steel stove and oven. Almost the entire port side counter top is access to the refrigerator, which is also front loading, and the freezer compartments with separate controls. Above the port counter are storage cabinets and a shelf above. The microwave oven is built-in and forward. The forward section of the galley has a large countertop with open storage above for dishes and glasses while below are numerous cabinets and drawers. Across from the galley is the Navigation Station with access to the electrical panel, battery switches and generator controls. The navigation station has a lift desk top. Under the seat is he inverter and battery charger. Outboard are storage areas and there is a storage shelf outboard. An array of electrics and other monitors are here. The main salon is large and accommodating for a crowd. To starboard are two built-in seats with a table between that opens for storage. Above the seats are fore and aft bookcases and storage. All the way forward is the entertainment system with two cabinets for storage and a green Corian shelf. Overhead is a hatch with solid cover and screen. To starboard is the convertible dinette and settee. The dinette can be lowered and a filler cushion will produce a large additional berth. The C-shaped settee is very comfortable with think cushions. Outboard are two large storage cabinets with a storage shelf below. Over the cabinets is shelving. Overhead is a hatch with solid cover and screens. All the way forward is the master cabin with a centerline queen berth. As you enter the master and immediately to starboard is the shower stall with a unique etched shower door, seating and opening port. To starboard is the master en-suite head with vanity and Vacu-Flush toilet. Aft is a locker with shelving while along the starboard side is a hanging locker and three drawers. Under the berth are four additional drawers. Along the portside is additional storage with two large cabinets and three drawers. Outboard are large shelfs. Forward is a bookcase. The sides are beautiful wood slates and there Are two overhead hatches with solid covers and screens. The galley is in the main cabin along the port side and features storage and food preparation areas that will please even the most discriminating onboard chef. There are 1000 total amp hour of batteries and a generator and inverter that make running the 120 volt ships systems while at the dock or underway easy and convenient. Engine room access is easy with full views and the engine room’s foil covered foam insulation is very effective in keeping the interior of the boat quiet. *Engine hours are as of the date of the original listing and are a representation of what the listing broker is told by the owner and/or actual reading of the engine hour meters The broker cannot guarantee the true hours It is the responsibility of the purchaser and/or his agent to verify engine hours, warranties implied or otherwise and major overhauls as well as all other representations noted on the listing brochure.